One activity that both my son and daughter love is playing laser tag. We’ve hosted birthday parties at our local laser tag center and have played laser tag when on vacation a few times. Now, Nerf is bringing real laser tag action to everyone with their new Nerf Laser Pro Ops blasters. Laser Ops Pro are new Nerf blasters that are ready to use right out of the box. There are two Laser Ops Pro blasters available now: the Deltaburst and the Alphapoint. Both blasters are fun and easy to use. The Deltaburst is a large blaster that fires a multi-shot IR burst with each pull of the trigger and registers hits with lights and sounds. It has an LCD screen on the back which displays health status and ammo capacity. It has unlimited ammo and a quick-reload button. 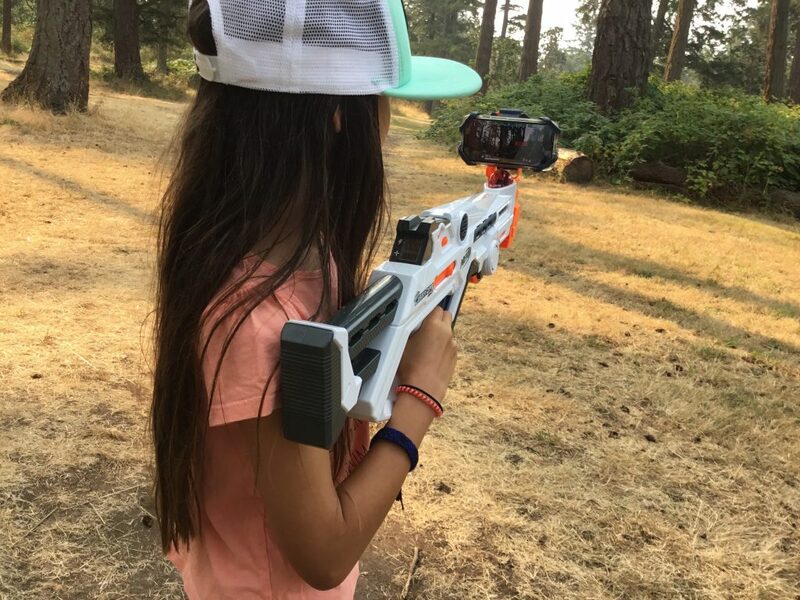 It can be adjusted for indoor and outdoor play and comes with an armband to secure your smartphone if you decide to play with the free Nerf Laser Ops App. The Alphapoint is a smaller blaster that fires a single-shot IR burst with each pull of the trigger and registers hits with lights and sounds. The lights on the back display health status and ammo capacity. The Alphapoint has unlimited ammo, the blasters have a quick-reload button to replenish supply. The Alphapoint blasters come in a 2-pack. They include armbands. 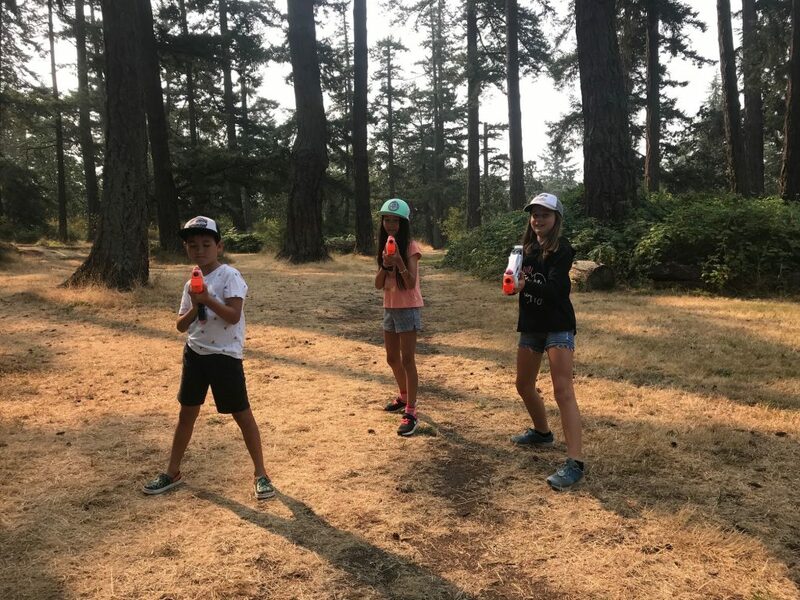 These Nerf laser tag blasters are ready to play right out of the box. You can choose to create teams or play free for all. To choose a team, players need to power on their blaster and press the reload button at the bottom of the blaster. You can select to be on team blue or team red. If you want to free play you can select the purple colour. Once you’ve decided which team you are on you can start using your blaster. Blasters technically have unlimited ammo but players need to reload from time to time. To reload, simply press the reload button at the bottom of your blaster. Lights on the blaster will indicate when you need to reload. The sound also changes when you are out of ammo. When a player is hit, a red light at the top of the blaster will appear. You will also see your ammo indicator light up red and hear a sound. Players can get back into the game a few moments after being hit. There are a few play options with the Nerf Laser Ops App. You can play solo with the Deltaburst or Alphapoint blasters. To do so, you’ll need to set up your smartphone in the holder in front of the blaster. Once you are set up, you can access a real-time battle and blast spaceships with your blaster. You can play multi-player games with one device or several devices. To do so, players must sync their blasters (instructions are very easy to follow within the app) and start a timed game. When playing with the app you’ll be able to see how many points each player obtained at the end of the game and see who won. My children really like playing with their Nerf Laser Ops Pro blasters. I like that there are no darts to insert into the blasters and that it’s easy to reload. Both blasters are easy to use and fun. My kids prefer the size and portability of the Alphapoint blaster. I think these new Nerf Laser Ops Pro blasters are a great game to play with a group of kids. I especially like seeing my kids play outside and use trees and shrubs as shelters. 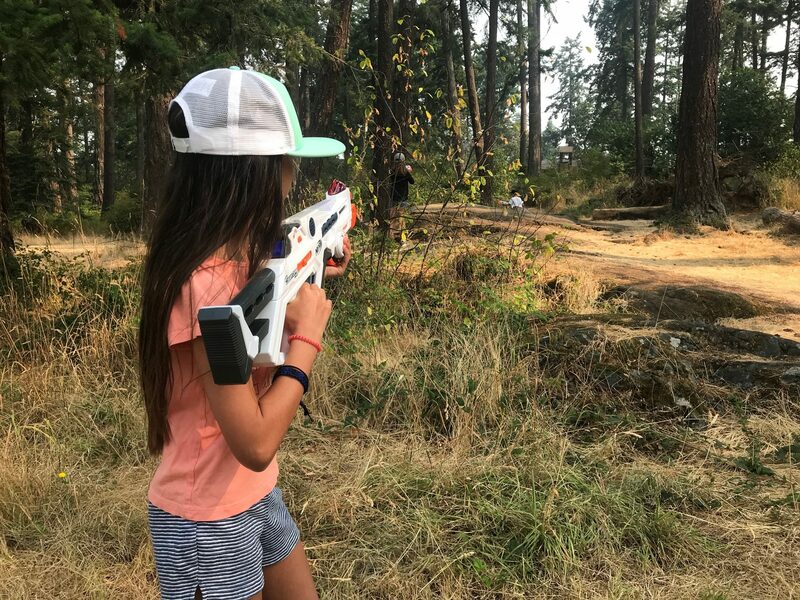 Nerf Laser Ops Pro blasters are recommended for children ages 8 and up. You can purchase Nerf Laser Ops Pro blasters online and in stores now. 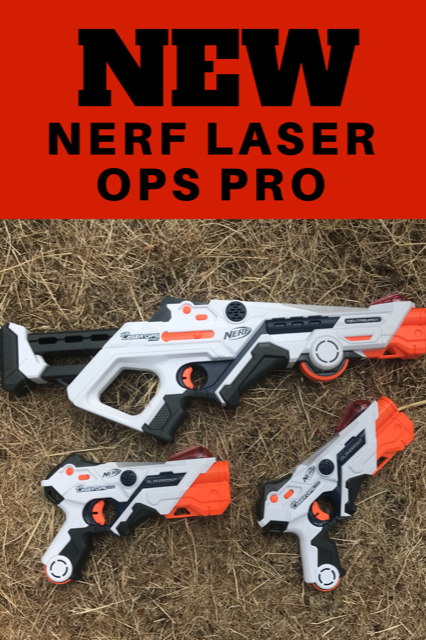 Hasbro wants one of my lucky readers to experience how fun their new Nerf Laser Ops Pro Alphapoint blasters are. They are giving away a 2-pack to one lucky reader. To enter, tell me where your children would play with their Nerf Laser Ops Pro blasters. Then fill out the Rafflecopter form below. Giveaway runs from August 14 to August 24, 2018. Open to Canadians only. Mandatory question must be answered to be eligible to win. Winner has 48hrs to claim their prize. Void where prohibited. See my Terms & Conditions for full giveaway information. My grandsons love this kind of toy, and my granddaughters like the water shooters. I think this would definitely get my son off the xbox and outside for a change! These would be excellent for my kids, they love Nerf! ..Just about anywhere they could! Mostly when we go camping is where they would play! Lots of trees & places to hide! My kids would play with these at the cabin on the river, especially on September Long Weekend. My sons would be ALL over these, probably would take them out camping!! We would play in our backyard, we have an acre and it would be perfect! My kids would play at the park behind our house! In the park where we camp – a perfect place! They would definitely play in our basement and backyard!! My granddaughters would play in the backyard or the park! Thank you! My kids would play in our back yard. I would take the boys to the park to play with these as we are in an apartment and don’t have an outside space. They’d play in the backyard. In the front yard, or at the park. These are so awesome! My little nephews would love to play with them in the backyard! They would play out in the park down the street – perfect spot! My kids would play with these at the park. They would play with them out in our yard. Probably play in the basement or in the backyard. They would play in the school yard down the street! My boys would play with these in our backyard and throughout the house. Our children would love to have these, so would us adults. Our kids would play here at our house in the woods (which is our yard) between our home and their grandparents house. Who ever wins I know will have a blast! Congrats in advance to that lucky winner!! In the forrest at the park. They would play in our backyard and in the large field nearby. My kids would play with these in our yard, while camping or out on the trails behind our house. This would be so much fun! They would play at our cottage in a nice forested area! They would play at the cabin! They’d play with friends in our back yard. This would be awesome! 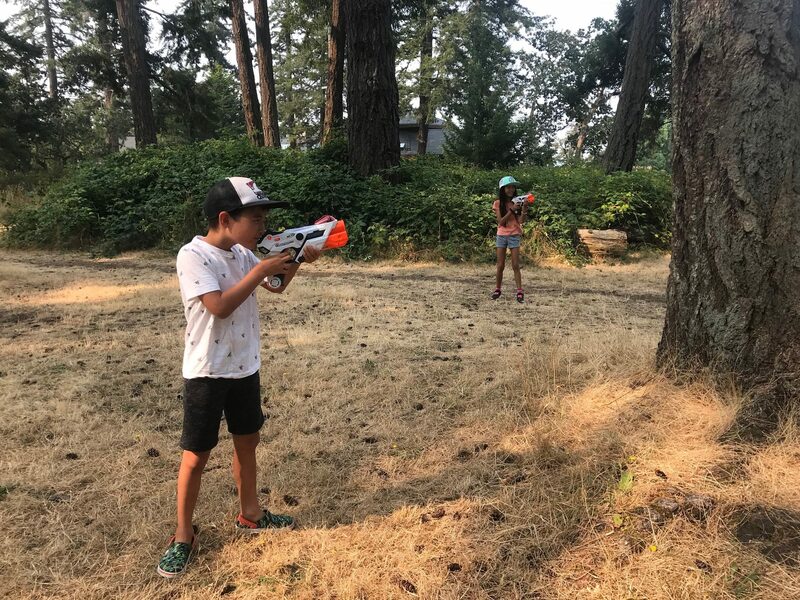 My son loves to run through the trees at the campground in the summer and this would be so much easier then looking for the missiles he fired after they play! The would play in the woods near my house. In the woods beside the house. 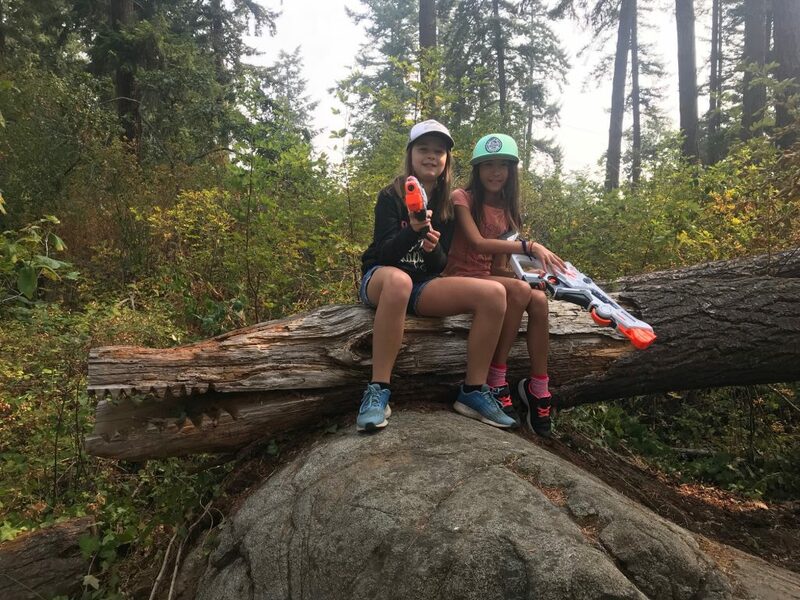 My kids love to play nerf anywhere from our house to the local park! Our local pool even has nerf nights where kids can take the water guns in the pool fir a nerf war. My kids are addicts! 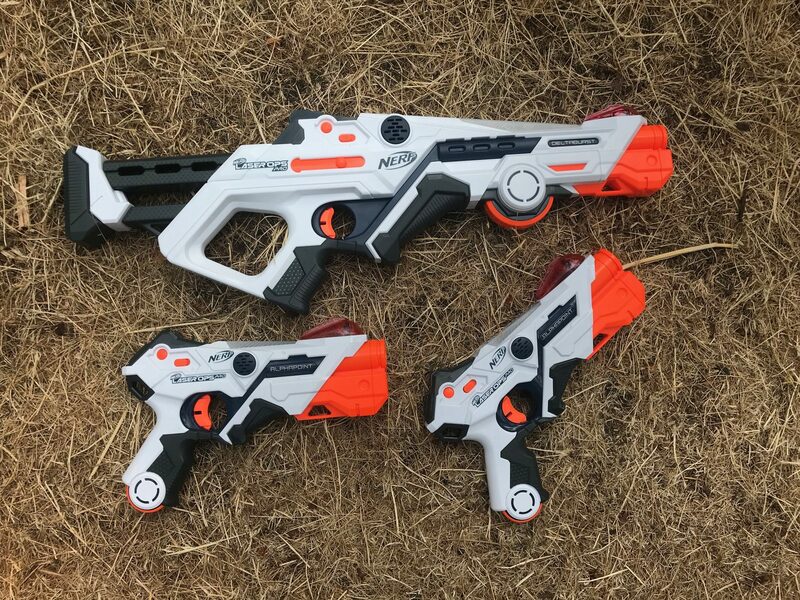 There is a wooded trail behind the house that would be fun with these Nerf Alphapoint Laser Ops Pro blasters. My grandkids would use them in the park. Where would they NOT play with it? These would be used all over the house and yard! My granddaughter would play in the back yard and probably take it to a friend’s home. 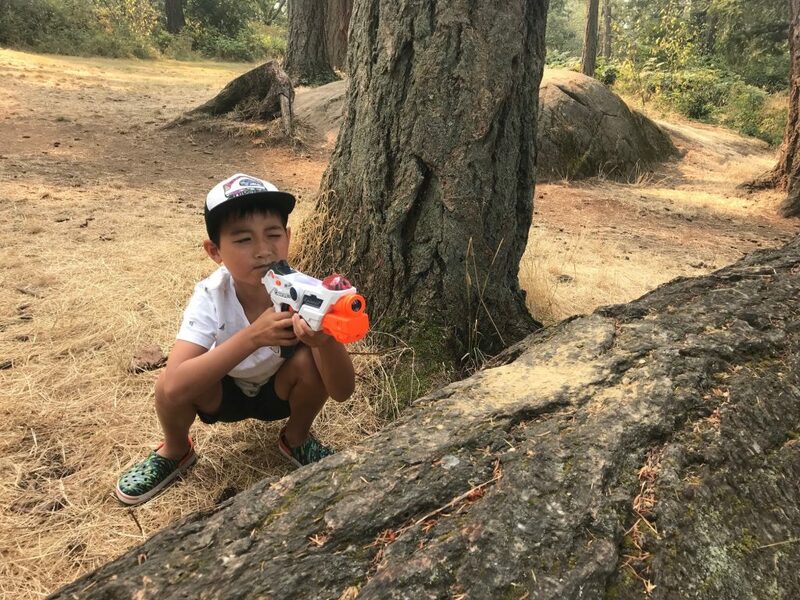 Our little guy would be playing with the new Nerf Alphapoint Laser Ops Pro blasters in the backyard, at his grandparents homes, his cousins, and in the local parks. My kids would play with these nerf all around our yard. My kids would LOVE to play this with the neighbour kids, running between our yards. They would probably play with it down at the park. In our backyard. My boys would have a great time with these. Thanks for the chance! My kids would love to play in the yard with these. BUT they are older so I would love to win to donate them at Christmas for a needy child. My boys would love love love to play with these in our backyard! We have a big backyard and lots of trees to hide around. Thanks for this generous chance! This would be perfect to play out with friends in the yard or take it out to the park for more space! I’m sure my fiancée would want to play with this as much as my son would, ha!